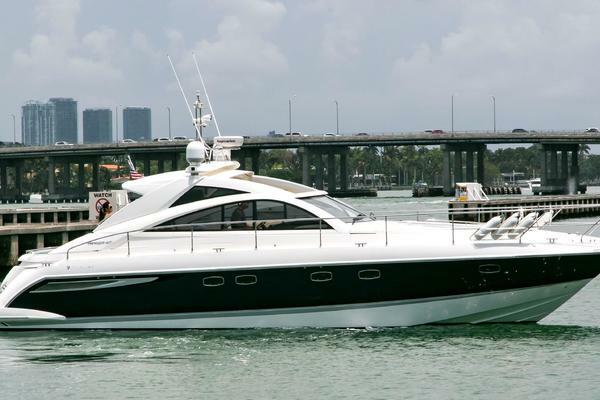 United Yacht Sales New Jersey would love to guide you through a personal showing of this 57' Viking Sport Cruiser 2006. This yacht for sale is located in Haverstraw, New York and priced at $675,000. For a showing please contact us by filling out the form on this page and we will get back to you shortly! Entering the salon, the spacious accommodations are bathed with light from large, wrap-around windows. Conversation and entertainment are engaging as the ingenious design of the 57 Flybridge yacht has created a seamless flow between salon, galley, dining area, and lower helm. The salon includes a large U-shaped settee to starboard which faces the state-of-the-art Bose entertainment system with large flat-screen LCD TV. The entertainment center is flanked by two moveable chairs. Moving forward, interior access to the flybridge is available via an elegant spiral staircase to port. Continuing forward and to starboard, the large dining area is situated adjacent to the galley and helm. To port, the mid-level galley includes all of the appliances expected in a fully-equipped galley including dishwasher, microwave/convection oven, four-burner stove, utility center below galley with washer/dryer, additional freezer and storage center. Forward of the galley is the lower helm station that puts all of its power and function within easy reach of the operator. To port of the helm is the companionway to the accommodations on the lower deck. To port is the guest cabin with twin berths, large double hanging locker, flatscreen LCD TV, DVD/CD/Stereo. Opposite the guest cabin is the master-suite situated amidships. The master-suite includes a queen island berth with custom mattress, expansive storage drawers and lockers, flatscreen LCD TV, DVD/CD/Stereo, and vanity forward of the berth. The en-suite head is large and roomy including large vanity and separate walk-in shower. Continuing forward to the forepeak, the VIP stateroom includes a large queen, centerline, island berth with custom mattress, flatscreen LCD TV, DVD/CD/stereo, and private access to the guest head. Stowage is expansive with lots of drawers and hanging lockers. Tranquilityis equipped with a fully-functioning galley capable of preparing gourmet meals for owners and guests. Contrary to many of her competitors, the Viking Sport Cruisers 57 Flybridge Yacht has a galley arrangement which allows for open viewing of the dining area and salon. Ample storage is available in the galley to provision for extended cruising. Additional stowage is available within the utility center at the inboard section of the galley which includes a chest freezer, washer/dryer, cabinets, and machinery/systems access. A large storage box is also included beneath the galley sole. When removed, easy access to pumps, AC units, and ships systems is thoughtfully provided. The engine area of the Viking Sport Cruiser 57 Flybridge is accessed from the cockpit and is thoughtfully designed making all machinery easily accessible. Generous use of acoustical insulation makes for quiet and comfortable cruising.Tranquilityis impeccably maintained by a professional crew and her engine room exhibits attention to detail. Aft of the engine room access is an expansive lazarette with room for all of the toys and more. Transformers, chargers, and ships systems are easily accessible and storage areas are cavernous.